If you run a popular restaurant, you know the importance of managing customer bookings properly to avoid potential headaches. Book a Table is a WordPress plugin that adds an online booking system to your restaurant site. It let you add, delete or cancel bookings from the back-end. The plugin allows your guests to book 20 people at one time. Email notifications are sent to webmasters and their guests. You will be able to manage tables for each restaurant. You will be able manage schedules and table plans from the back-end. 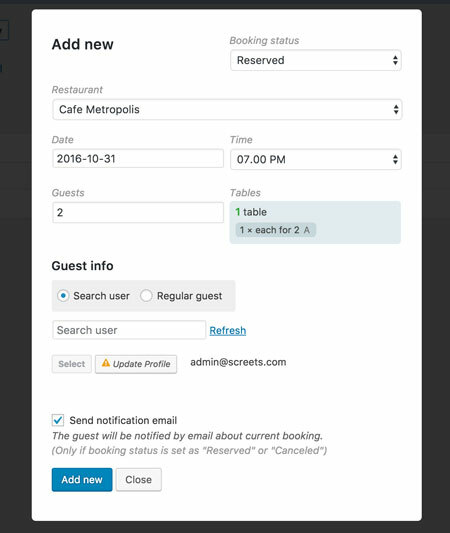 The plugin can be used to manage bookings for multiple restaurants. The plugin allows your visitors to book a table without registration. You can also change contact page, site logo, and other info in the backend. This is a commercial plugin.